Why do Iranian police uniforms say "police" in English? 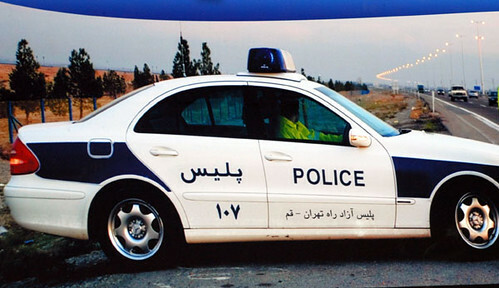 Why are Iranian police markings written in English? Post-election protests continued in Tehran for the fifth day on Wednesday. In many photos, riot police wear uniforms with the English word police on them. Ambulances, too, bear the word ambulance in English. Why not use Persian words instead of their English equivalents? Because everyone knows English. Like many capital cities, Tehran has its emergency personnel wear markings that are internationally recognizable. 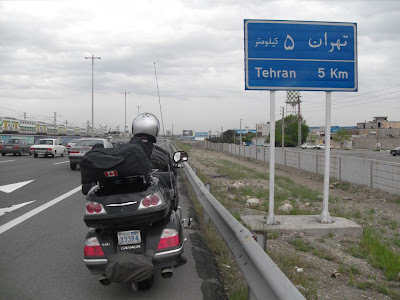 Street signs, too, are translated into English, and police cars are generally inscribed in both English and Persian. That makes the city more tourist-friendly without sacrificing clarity for locals. After all, the Persian word for police is the same: polise. (Persian, or Farsi, is an Indo-European language that uses an Arabic script, but people will often use Latin lettering, also known as Penglish or Fingilish, especially when typing or texting.) It’s also the same word in French (police), German (polizei), Italian (polizia), Czech (policie), and many other languages. Iranian students are required to take English classes in high school. So using the English word for police actually maximizes the number of people who will understand it. Police isn’t the only word Farsi borrows from English. There’s a long list of “loanwords” that have trickled into the language since World War II. For example, Iranians use the words computer, chat, and mobile (as in, cell phone) in the same way English speakers do. Hot dog isn’t a perfect translation, but it refers to a sausagelike sandwich popular in Iran. Persian slang often incorporates English, too. The phrase love terekkundan—literally, to burst with love—is slang for hooking up. Top means cool. And you can use the phrase trip zadan to say, “He’s tripping,” in a literal (i.e., drug-related) or figurative sense. The Iranian government has long tried to keep English and other foreign languages from influencing Persian. In the mid-20th century, the Persian Academy—an institution established in 1935 to preserve the language, much like its French counterpart—noted that the English word airplane was creeping into the Iranian language. The academy’s linguists successfully replaced it with the Persian word havapeyma. They have had less luck with helicopter and cabin, which are still used regularly instead of their Persian substitutes, charkh-baal and kabin. In 2006, the academy drew much ridicule when it tried to reterm pizza as, literally, “elastic loaves.” Borrowing occurs in the other direction, too. The words azure, chess, cummerbund, jasmine, pagoda, pajamas, and salamander all come from Persian. Farsi actually borrows a lot more from French than it does from English, because of the strong French influence in the region in the 18th and 19th centuries. The Persian words for actor (aktor), pineapple (ananas), steak (biftek), truck (kamion), and many more come from the French. Bonus Explainer: Is Farsi the same as Persian? Yes. Both refer to the language spoken in Iran. The country was actually called Persia until the 1930s, when Shah Reza Pahlavi asked foreigners to start referring to the country by its native name, Iran. Likewise, Farsi is the word native Persian speakers usefor Iran’s language. (An English speaker calling the language Farsi is a lot like referring to French as Français.) Scholars have since battled over which term—Persian or Farsi—is more authentic or empowering. Some say Farsi sheds the colonial overtones of Persian. Others suggest that calling it Persian is proper, since like French and German, that’s the English word for it. The Persian Academy prefers Persian. Explainer thanks Goli Fassihian of the National Iranian American Council, Ali Motlagh of Columbia University, and John Perry of the University of Chicago.